Spain's economy has been stuck in recession for nearly two years but the latest survey data suggest manufacturing may be stabilizing. Spain and the U.K. lifted Europe's economic gloom a touch Monday with the strongest readings of manufacturing activity in many months. 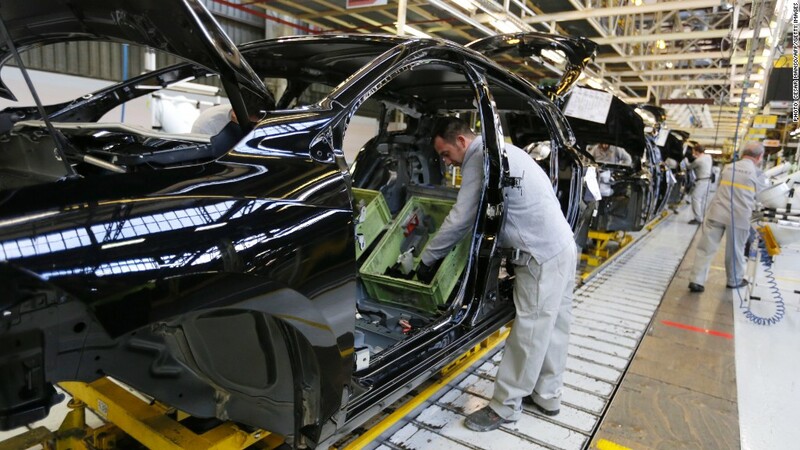 While Spain's manufacturing industry continued to contract in May, it did so at the slowest rate in two years, according to Markit's purchasing managers' index, as new export orders came through. U.K. factories reported their second consecutive month of growth, thanks largely to improving domestic demand but also a modest increase in new export business. Overall, the downturn in eurozone factories eased for the first time in four months, and the PMI for Germany suggested the rate of decline in the region's manufacturing powerhouse has slowed to a negligible pace. The PMI data was stronger than analysts expected, and could mean the region is beginning to benefit from a recent decline in the value of the euro and the pound. The euro has fallen to around $1.30 from $1.37 in February, and the British pound is now worth about $1.52, down from $1.63 at the start of the year. While conditions remain tough for Europe's factory operators, evidence that the sector is stabilizing is likely to encourage the European Central Bank and Bank of England to hold off relaxing monetary policy any further just yet. "The improved May Eurozone manufacturing purchasing managers survey eases pressure on the ECB to take interest rates down from 0.50% to 0.25% as soon as its June meeting this Thursday," noted Howard Archer, chief economist at IHS Global Insight. The Organization for Economic Co-operation and Development called on the ECB last week to do more to stimulate the eurozone economy, building on its decision last month to cut interest rates to a record low. ECB President Mario Draghi has said he's ready to act again to help lift the region out of recession, but most economists expect no change in policy when the central bank's governing council meets Thursday. In a speech in Shanghai on Monday, Draghi said the eurozone was still facing a challenging situation, but that there were a "few signs of a possible stabilization." He added that the bank continued to expect a "very gradual recovery" to start later this year.